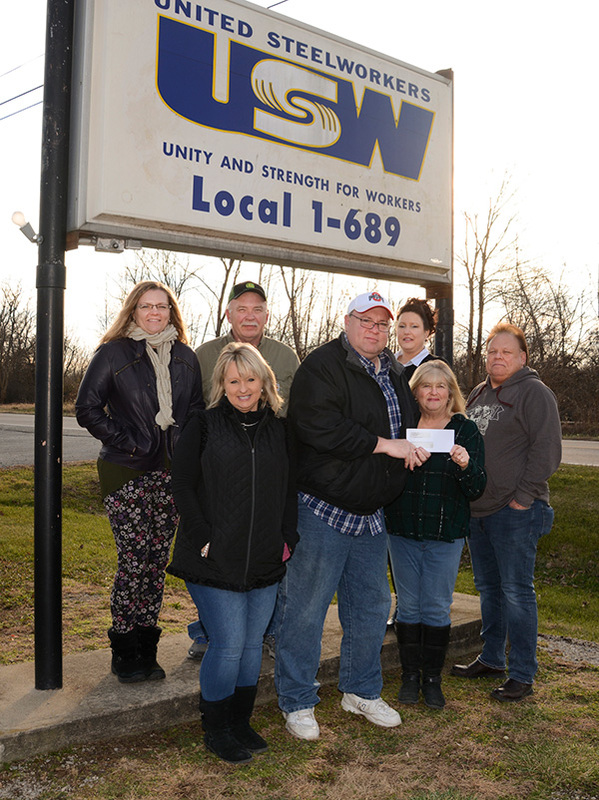 PIKETON, Ohio – On Dec. 14, United Steelworkers’ (USW) Local 1-689 Women of Steel donated $400 to the Good Samaritan Network’s Food Pantry in Chillicothe, Ohio. Approximately 1,000 families a month are given food from the pantry’s shelves. Shown at the recent donation from the USW Women of Steel of Piketon to the Ross County Good Samaritan Network Food Pantry , from left, are Andria Smalley, Theresa Workman, Lou Thompson, Rob Downard (Good Samaritan Network), Jodi Jenkins, Francie Mullins and Mark Veach. Not pictured, Lisa Jenkins, Brook Pyle, Melissa Sammons, Sandy Stanley and Jeri Trent. Manager Rob Downard said about 40 percent of Ross County residents are eligible for assistance. “My personal goal is to get more baby formula on the pantry shelves because more and more grandparents are taking on the care of their grandchildren because of drug problems in the family. The problem is, they’re on a budget and they weren’t expecting this responsibility. Baby formula is outrageous and they just can’t afford it. No child should go hungry, no matter what other people have done,” Downard said. The pantry, which was formed by area churches in 1981, opened its 255 N. Woodbridge Avenue facility in Chillicothe in 2014. Five days a week, volunteers at the pantry distribute some of life’s necessities to the needy. More than 70 volunteers staff the facility. Recipients are referred by area churches and social service agencies such as Calvary Lutheran Church, the Salvation Army and Job and Family Services.